The state’s largest-ever teacher pay raise has boosted morale in school districts across the state but has had little immediate effect on Oklahoma’s severe teacher shortage, according to a new survey from the Oklahoma State School Boards Association. Oklahoma schools are starting another year with nearly 500 teaching vacancies despite a heavy reliance on emergency certified teachers and adjunct instructors who teach on a part-time basis. More than half of superintendents who completed this year’s survey said teacher hiring is worse this year compared to last year. Uncertainty over the teacher pay raise hampered the ability of districts to leverage the increase as a recruiting and retention tool, OSSBA Executive Director Shawn Hime said. “The veto referendum effort left teachers with too much doubt about whether the raise was real. That missed opportunity meant many teachers made choices to leave the state or pursue other professions,” Hime said. 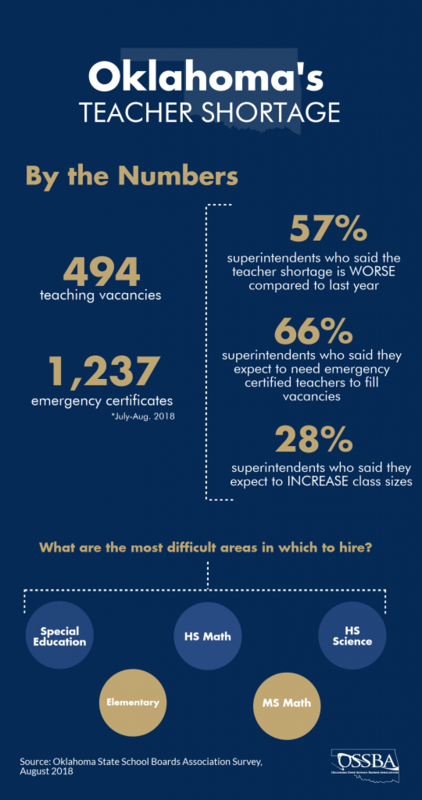 The state is already on pace to exceed the record number of emergency certificates approved last year, and two-thirds of districts that responded to the survey said they expect emergency certified teachers will be needed to fill remaining vacancies. The results from OSSBA’s fifth annual survey clearly underscored how much work remains to rebuild the broken teacher pipeline and the importance of a plan to at least reach the regional average in education investment, Hime said. Additional funding would enable a broad-scale effort to restore teaching positions cut over the last several years, reduce class sizes and rebuild academic and extracurricular programs. After years of cuts in teaching positions, this year’s boost in overall education funding tied mostly to the teacher pay raise and confidence that better financial days are ahead led more than 100 school districts to add at least one teaching position since last school year. However, most of those districts are relying on emergency certified teachers and about half of those districts still have teaching vacancies. Nearly 40 districts are planning for fewer teacher positions this year. Districts reported 494 teaching vacancies as of Aug. 1. Fifty-seven percent of districts said hiring was more difficult this year compared to last year while about 35 percent said it was the same as last year. Many districts reported that the pay raise was helpful in convincing some teachers contemplating retirement to remain in the classroom. Special education teaching positions remain the most difficult to fill. More than half of districts responding reported that special education teachers are very difficult to find, and special education teachers aren’t eligible for emergency certification. After special education, high school science, high school math, elementary, middle school math and middle school science were the most difficult to fill. The number of districts that said they would further increase class sizes to cope with the teacher shortage fell this year to 28 percent from 55 percent last year. About 43 percent districts anticipate hiring retired teachers and about 35 percent expect to hire adjunct instructors to fill gaps. The teacher shortage crisis continues to be so widespread that it’s negatively affecting urban, suburban and rural schools desperately searching for teachers. Over the last several years, ballooning class sizes and cuts in course offerings have affected districts of all sizes. But it’s in suburban districts where the tension between an improving financial outlook and the teacher shortage appears most evident. Broken Arrow is adding teaching positions because of enrollment growth but is among those with unfilled vacancies even after filling about three dozen positions with emergency certified teachers. The story is similar across the state’s largest suburban districts. Moore Public Schools Superintendent Robert Romines said he’s seen a slight uptick in interest in teaching positions that he’s hopeful will continue to grow. But like Broken Arrow, the district is struggling to fill additional teaching positions. This year’s survey again asked district leaders about their experience with emergency certified teachers. As was the case last year, superintendents reported mixed success but deep gratitude for those willing to fill open positions. Among the most common concerns: an overreliance on inexperienced teachers is compromising student achievement, the lack of additional resources for teacher training and the burden on veteran teachers and building administrators trying to assist teachers new to the profession.